This score undoubtedly marks an important turning point in Verdi’s operatic writing, because it brings to the foreground the characters’ introspective, psychological aspect, which would be the fundamental feature of most of the maestro’s later creations. 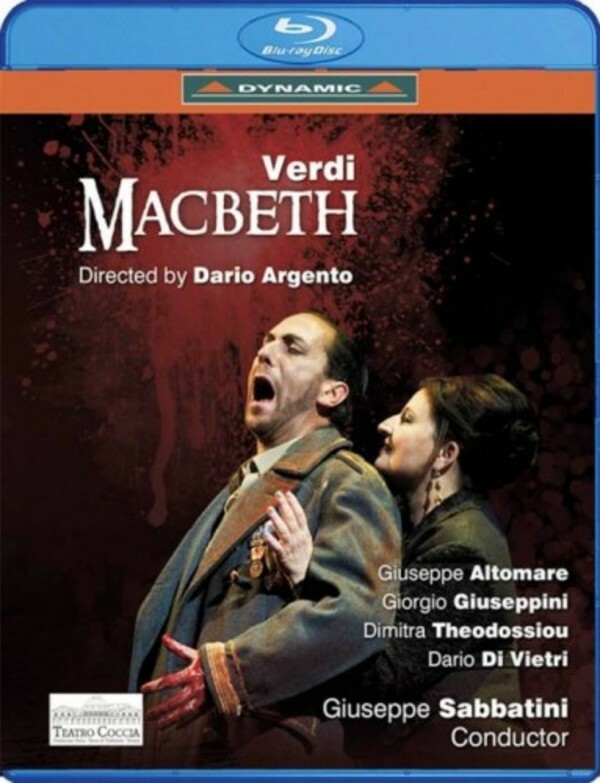 This DVD recording documents the production staged at Novara’s Teatro Coccia during the 2013-2014 season, with Dario Argento tackling for the first time the direction of an opera. Verdi’s masterpiece was not new to the director from Rome, who had used it as a backdrop for his 1987 film 'Opera', set at the Teatro Regio in Parma, indeed during a staging of Macbeth. From the master of thriller and horror one could only expect a direction in line with his previous film-making background, and from that point of view, this Macbeth does not fail expectations, with its bloody, indeed gory scenes - they are, at any rate, consistent with the dark and brutal character of Shakespeare’s tragedy. But aside from all of that, Dario Argento’s direction reveals extraordinarily theatrical qualities, greatly enhanced by the conducting of Giuseppe Sabbatini who, on the podium, takes tempos that befit to perfection the unrolling of the drama.